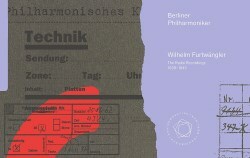 Berliner Philharmoniker Recordings has released, on 22 hybrid SACDs, its Wilhelm Furtwängler edition, the first complete collection of all the surviving radio broadcast recordings of the Berliner Philharmoniker conducted by Furtwängler during the period 1939 to 1945. From a total of 21 concerts, most complete and some in part, these recordings were originally produced by the Reichs-Rundfunk-Gesellschaft (RRG) and are the first high resolution digital transfers from original monaural analogue sources. This collection The Radio Recordings 1939–1945 is intended to allow the listener to experience the Berliner Philharmoniker in collaboration with Wilhelm Furtwängler, the conductor the players revered so much. Owing to the period these were produced they are sometimes described as the “war recordings” and are greatly prized, being regarded as the peak of Furtwängler’s conducting career. In addition, these historical performances were recorded with the added pressure and threat of working in Nazi Germany with great emphasis placed on music performance from the Third Reich leadership. Not surprisingly, the majority of the recordings focus on Austro/German repertoire of the 19th century, with symphonies and solo concertos by Beethoven, Schubert, Weber, Schumann, Wagner, Brahms, Bruckner and Richard Strauss plus some Handel, Gluck and Mozart. Sibelius and Ravel are also represented, as are a few of then-contemporary composers, Heinz Schumann, Pepping and a work from Furtwängler himself. There is some duplication, notably Mozart’s Symphony No. 39 and Beethoven’s Symphonies no’s. 4 and 5. Given the difficulties of the time the incomplete concerts aren’t too much of a problem; however, a couple of the works are incomplete. When the old Philharmonie was destroyed by bombing on 30th January 1944 the orchestra moved around a number of other Berlin buildings suitable for holding concerts and included here are recordings from Beethoven-Saal, Staatsoper Unter den Linden and Admiralspalast, also Haus des Rundfunks and a workers concert at AEG turbine factory. At the end of World War 2 the Red Army occupied Berlin, and in the Haus des Rundfunks on Masurenallee a Soviet army officer took from the sound archives around 1,500 classical music tapes that were sent back to Moscow. In 1956 some of these recordings started to appear as LP releases on Melodiya, the Soviet State record label. Klaus Lang, music editor at Sender Freies Berlin (SFB), had talks with the Moscow Radio department about the missing tapes and subsequently some copies of the Furtwängler recordings were returned, a number with reverberation added. Deutsche Grammophon issued some of these recordings on 10 CDs. In 1990, following the fall of communism and German unification, SFB requested the repatriation of the original tapes. As a gesture of goodwill, a considerable number of the RRG tapes were returned up to 1991 but some were absent; this is still the current position. The majority of the Furtwängler recordings on this edition were produced under sound engineer Dr. Friedrich Schnapp who in October 1939 succeeded Kurt Rasch. Schnapp went on to supervise Furtwängler’s radio broadcasts until the end of the war. Commencing in the 1940/41 season the concerts were no longer transmitted live but recorded earlier, for Sunday radio broadcast. A procedure sometimes followed was to choose the best of the three concerts in the series and also in rehearsal which were chosen for broadcast. Some of the original shellac discs and tapes were probably lost in a fire whilst in storage by the RRG and this is probably the reason why some of the concerts presented here are incomplete. Usually, from the original raw concert recordings, a new tape was made and edited then copied onto transmission tapes which were then used for broadcast. For this edition sound engineer Nikolaus Löwe remastered the original RRG tapes scored at RRB which hadn’t been worked on since 1991. Using a retrofitted Telefunken M19 tape machine Löwe digitized them in high resolution at 24bit/96kHz. A small number of the tapes seem to have lessened in quality since 1991 but the sound engineers have stated that “the vast majority showed a distinct improvement in the direct digital copy”. Additional technical details are contained in the booklet. Furtwängler (1886–1954) is widely accepted as being one of the greatest conductors of the twentieth century. He left a fascinating and substantial audio legacy including a substantial number of live events that are cherished by a large and enthusiastic group of devotees. Much has been written about the sheer individuality of Furtwängler’s interpretations. There is the beauty of the sound that he demands, his innate sense of the music’s structure, the incredible energy produced and the remarkable emotional intensity generated. Furtwängler’s conducting has a sense of spontaneity and I am often surprised at his fluctuating tempi and bold dynamics. Whether or not his idiosyncrasies are felt to be invasive will be very much down to personal response. Here, the Furtwängler set contains several performances that I believe are some of the finest ever recorded; there are especially successful Beethoven recordings and I have listed my stand out recordings. The performance by concertmaster Erich Röhn of Beethoven Violin Concerto, which contains playing of both distinction and beauty of a level rarely encountered. Furtwängler is captivating in the Beethoven Symphony No. 5 (1943) providing readings of tension and nobility. Bold and infused with incredible foreboding and intensity, Beethoven’s Symphonies No.’s 7 and 9 ‘Choral’ make a quite tremendous impact. Exuberant and uncommonly witty, I greatly admire Furtwängler with Richard Strauss’ Till Eulenspiegel. Furtwängler first conducted the Berliner Philharmoniker in December 1917; however, he also had long associations with several other orchestras that are often forgotten. In 1922 Furtwängler succeeded Artur Nikisch and served as principal conductor of the Berliner Philharmoniker during the years 1922–1945 and, following his denazification, again in 1952–1954. The Berliner Philharmoniker was almost certainly the world’s most famous orchestra – it probably still is – and right through the Second World War it served as the cultural flagship of Hitler’s Third Reich. Blacklisted by the Nazis and fearing arrest, Furtwängler fled to Switzerland in February 1945, a few months before the end of the war. During his absence Leo Borchard, who was Moscow-born of German parents, an obvious favourite of the occupying Russian forces, was appointed to the post. After only a few months with the orchestra Borchard was fatally shot by an American sentry after a misunderstanding at a Berlin check-point. Romanian Sergiu Celibidache became an intermediate appointment as principal conductor and was in effect keeping the seat warm until Furtwängler was allowed to return. After his denazification process in December 1946 Furtwängler, who was revered by the majority of the players, was cleared to return. He began conducting his first Berlin concerts in May 1947 at Titania Palast, effectively sharing the conducting duties with Celibidache, returning officially as the orchestra’s principal conductor in 1952 and remaining until his death in 1954. The majority of works contained on The Radio Recordings 1939–1945 have been released widely over the years, with the Beethoven Symphony No. 9 being the most popular (I’ve counted over 20 releases). There were just two instances where I didn’t notice other alternative recordings, namely Beethoven’s Symphony No. 7 from March 1942 and Ravel’s Daphnis et Chloé, Suite No. 1 (incomplete) from March 1944. I have most of these recordings on other labels, mainly Société Wilhelm Furtwängler, Deutsche Grammophon and Pristine Audio, and I have undertaken a number of listening comparisons with this new collection, The Radio Recordings 1939–1945. Although acceptable and the best available for their time, several of the Furtwängler releases, notably on Music & Arts, Tahra and Deutsche Grammophon have been overtaken. For example, in the Beethoven Coriolan overture (1943) the louder passages make for an uncomfortable listen on the Deutsche Grammophon recording, but hold together surprisingly well in this new remastering. On the other hand, despite the new remastering, in the Die Meistersinger: Prelude (1942) the overall orchestral sound still sounds fairly sour. I’ve revisited some of the Beethoven recordings of the Société Wilhelm Furtwängler (SWF), France and I have to say that they have been impressively restored, especially the Beethoven Symphony No. 5 (1943). If all the contents of this new set don’t appeal, I recommend searching out these individual SWF recordings. The four Beethoven performances that Pristine Audio has released have been impressively remastered but in comparison this new set is an improvement, sounding a little recessed and less fiercely bright, albeit we are talking about very small margins. In truth, these recordings will still prove challenging to many listeners, but they are worth the effort owing to the excellence of some of the Furtwängler performances and the historical context of the time. All told, these successful high-resolution digital transfers using original sources make this the best available set. However, I can’t see this set appealing to those whose strong preference is for high-fidelity digital or analog stereo recordings. This hardcover edition is lavishly presented, including a 184-page book featuring numerous historical photos and several articles on the history behind the recordings. The restoration process is given in detail and there is a Furtwängler essay by the American musicologist Richard Taruskin. For those new to Furtwängler’s “war recordings” I recommend trying to look beyond the sonic limitations as there is so much to discover and bring rewards. Newly remastered with improved sound these historical Furtwängler recordings have never sounded better.